Apache OpenNLP is an open source Java library to be used to process Natural Language text. OpenNLP offers various services like tokenization, sentence segmentation, part-of-speech tagging, named entity extraction, chunking, parsing, and co-reference resolution, etc. This course provides how to use the OpenNLP library to design an efficient text processing service. 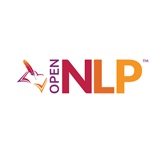 OpenNLP tutorial is designed for beginners to know how to use the OpenNLP library, and building text processing services using this library. To learn this tutorial one should have a prior knowledge of Java programming language.